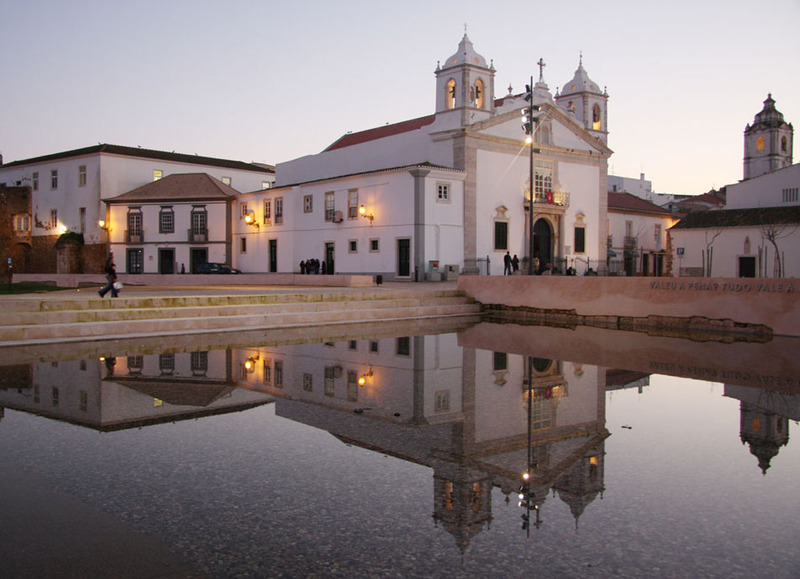 Visit the monumental Igreja de Santa Maria Church in Lagos, Algarve. The Igreja de Santa Maria Church, located in Praça do Infante de Lagos, dates back to the 15th and 16th centuries and preserves its 16th century entrance. The rest dates back to the 18th century, when it was restored after a devastating fire. Although the entrance does date back to the 16th, the rest of the building was built in the 19th century, after a devastating fire took place. It’s worth paying attention to the eerie mural behind the altar, where a battle between orange and purple angels is represented. In the interior, several images are prominent: the image of Nossa Senhora da Assunção and of Nossa Senhora da Piedade. In the sacristy there is a collection of 18th century images, of which the image of Menino Jesus Rei, dressed with clothes of the time, is truly unique. Just to the south of the church, you will find an area of the walls that has been restored. It originally dates back to the reigns of Manuel I and João III, around the 16th century. Praça do Infante Dom Henrique, Lagos, Algarve.